India’s biggest e-commerce retail stores FlipKart and eBay has got some competition now as the world’s biggest e-commerce company Amazon launches in India as Amazon.in. At this time, Amazon.in is selling only Books and Movies. They have started with a huge stock of millions of books and movies. Amazon.in has indicated that more categories like mobile phones and other consumer electronics will be added soon. Amazon came in India about an year ago with a product comparison website Junglee.com. It simply redirected the users to respective vendor websites. Its clear now that Junglee.com was launched to collect the data on Indian consumers and now that Amazon has sufficient data, it has launched its own e-commerce store in India. Though Junglee.com is still functional, it will be probably integrated with Amazon.in. If you have an account on Amazon.com (or Amazon.co.uk) you will be able to login to Amazon.in with same account details. Amazon.in, just like other popular e-commerce stores in India, has free shipping for all purchases above Rs. 499, which is about $10 (currency converter tool). And as expected, Amazon.in offers Cash on Delivery (CoD) option which is a must for any e-commerce website to survive in India because most Indians still hesitate to use their credit cards online. If you are one of the selected few who’d like to pay online, Amazon.in offers payment using internet banking, credit cards and debit cards. Amazon.in lets Indian vendors to setup a store on their website and sell products through it. Vendors can sell products in two ways on Amazon.in. They can either opt for ‘Sell on Amazon’ program OR they can opt for ‘Fulfillment by Amazon’ program. • In ‘Sell on Amazon’ program, a vendor maintains its own inventory. When a customer orders something on Amazon.in, the vendor ships the product to the customer and handle customer support services on their own. • In ‘Fulfillment by Amazon’ program, vendors can simply send their product stock to Amazon.in and then Amazon.in handles everything from there. 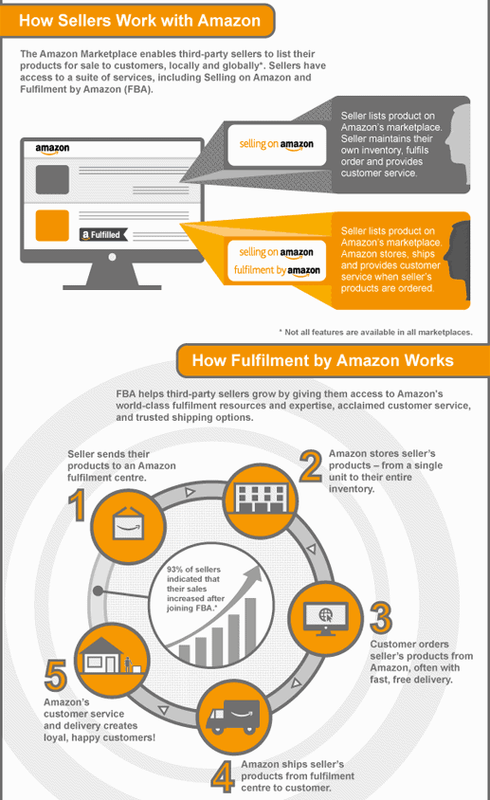 Please see the image below to learn how ‘Sell on Amazon’ and ‘Fulfillment by Amazon’ programs work on Amazon.in. Amazon is already popular in India for its Kindle Reader and very cheap Cloud Hosting Services, and its known in the world for its quality e-commerce services. Amazon.in is definitely a good news for India consumers.